Happy Easter. Our Lord is risen and we have so much to be thankful for today. One of the first things I think of on Easter is what a priest said on a retreat I attended years ago, that Easter and the risen Lord is the greatest event in the history of the world. Nothing can compare to it. Think about it and you’ll understand why. 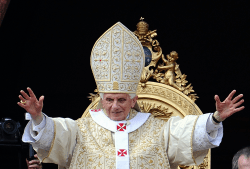 Our Holy Father, Pope Benedict, delivered his urbi et orbi in Rome yesterday. You can find the full text here. However, here are a couple of excerpts. Pope Benedict also had a message for those in strife torn countries like Syria. We can only hope and pray that peace comes to that region as well as others in Africa and even right here in the United States where we’re seeing a real persecution of the Christian faith.